A vascular catheter is also called a venous catheter. It is small plastic tubing that is surgically implanted into an animal's vein. This allows the researcher repeated access to the same vein without having to puncture the animal again. 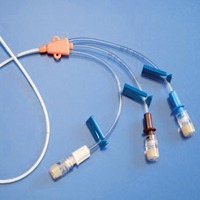 A vascular catheter may be used to draw blood or to inject medications intravenously (IV). A central vein catheter is usually inserted into the neck or upper chest. It is place in a large vein in the chest. The central vein catheter may be used to monitor the heart or deliver IV drugs or nourishment to the animal.